Both beauty and brains define the building of the Pittsburgh Botanic Garden on 465 acres near Settlers’ Cabin Park just 10 miles from downtown Pittsburgh. 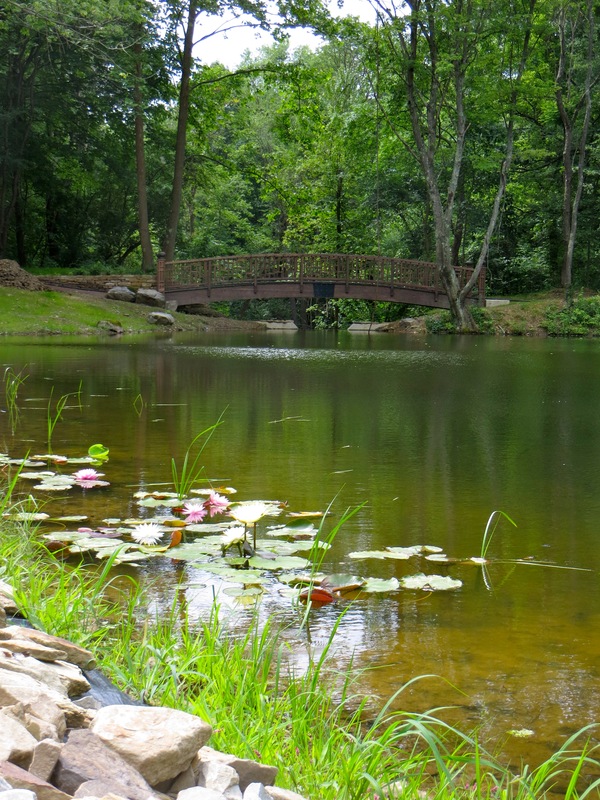 The Woodlands is the first 60 acres to open and consists of more than three miles of trails, a stunning meadow with over 550 native white dogwood trees and a serene lotus pond. That lotus pond is illustrative of the Garden’s Reclamation story. The Pittsburgh Botanic Garden is being built on land riddled with abandoned coal mines. Acid mine drainage had polluted the pond in the Woodlands: neither plants or animals could live in the pond which at pH 2.9 had an acidity similar to vinegar. The pond is now the centerpiece of the Japanese Garden, a key feature of the Asian Forest in the Woodlands. A drainable limestone bed, largely imbedded in the ground next to the pond, was filled with 450 tons of limestone donated by Carmeuse Lime and Stone Co. The draining mine water flows over the bed and the acid is neutralized. The system designed by Hedin Environmental, Inc. and Melissa Marshall of Marshall Tyler Rausch, Landscape Architects, Inc., purifies 11,500 gallons day. A walking trail was built on top of it to make it nearly invisible. When you visit, you will hardly detect the presence of the innovative passive water treatment system that brought the pond back from the dead. It’s hard at work neutralizing acid mine drainage and recycling the clean water to support the pond’s plant and animal life. The solution to the Woodlands’ acid mine drainage problem was awarded the 2014 Governor’s Award for Environmental Excellence and is a good example of effective public-private partnership. Financial partners in the pond restoration project include the PA Office of Surface Mining and the PA Department of Environmental Protection Growing Greener Program, the Allegheny County Conservation District, the Foundation for Pennsylvania Watersheds, Trout Unlimited, Colcom Foundation and an anonymous foundation. Trails, stunning bridge and stepping stones circle the pond, giving you a chance to enjoy every vantage point. The Japanese-style garden design includes areas for quiet reflection. In fact, it is the site of tai chi and yoga classes in good weather. There are more plans for the Japanese-style Garden. Click here for an opportunity to support our plans.